We have teamed up with some our celebrity supporters to help raise awareness of bullying. Watch our supporters such as Will Poulter, Tich, Twist & Pulse, Tony Discipline, Rebecca Craven and Layton Williams taking a stand against bullying. Enter our competition by simply posting the poem on your Facebook and Twitter! Help us spread the anti-bullying message and show you are taking a stand against bullying by sharing the poem on social media. Everyone who uses the hashtag #ListenUpYouBullies on Facebook or Twitter and includes the video link or jpeg picture of the poem (see below to download) will be automatically entered into our prize draw to win one of our exclusive anti-bullying wristbands. We will be giving out 5 every week for up to 5 weeks. That’s 25 wristbands up for grabs! Use the video to launch an anti-bullying poetry competition in your school/college/organisation. 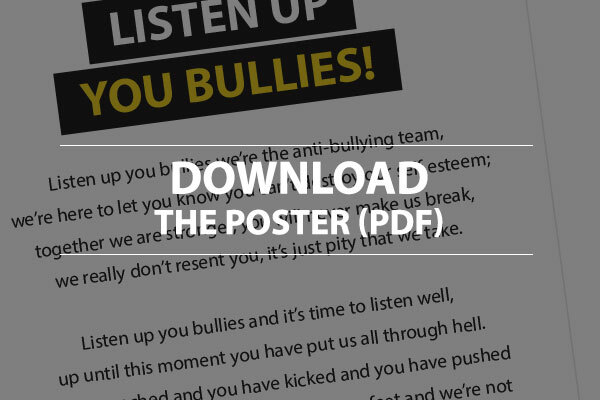 Make your own version of 'Listen Up You Bullies' poem and video it. Don't forget to Tweet us @antibullyingpro or www.facebook.com/AntiBullyingPro with your entries or email them to us antibullying@diana-award.org.uk and we will try and upload them to our website!